Richard Dadd (1817–1886), Contradiction: Oberon and Titania (1854-8), oil on canvas, dimensions not known, Private collection. Wikimedia Commons. By the middle of the 1850s, Dadd had not been outside an institution for over a decade. He had managed to keep his visual memory and imagination going, and conditions in the ‘criminal lunatic’ section of Bethlem Hospital were improving, with some segregation of patients giving him better access to books, and more comfortable surroundings. 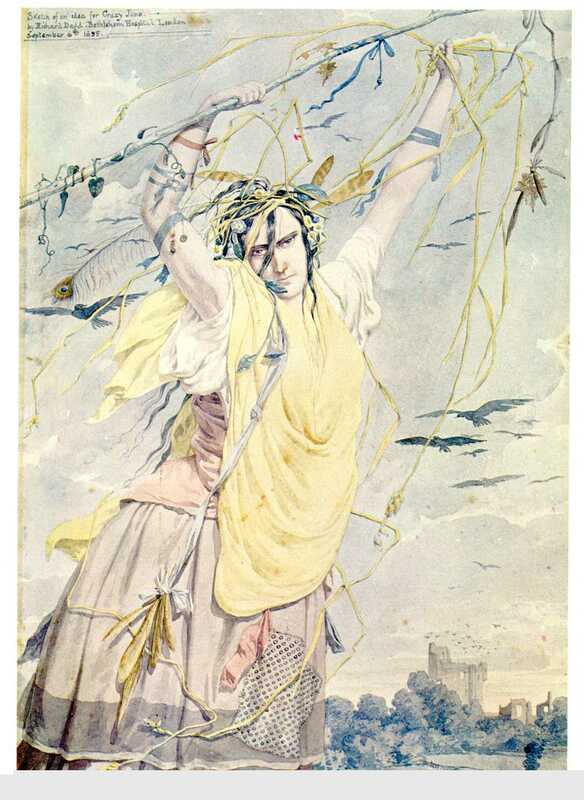 Richard Dadd (1817–1886), Crazy Jane (1855), watercolour on paper, 35.5 x 25.4 cm, Bethlem Royal Hospital, London. Source of image not known. Over that period, Dadd must have experienced a lot of disturbed and disturbing behaviour, but he seems to have made little reference to it in his paintings. 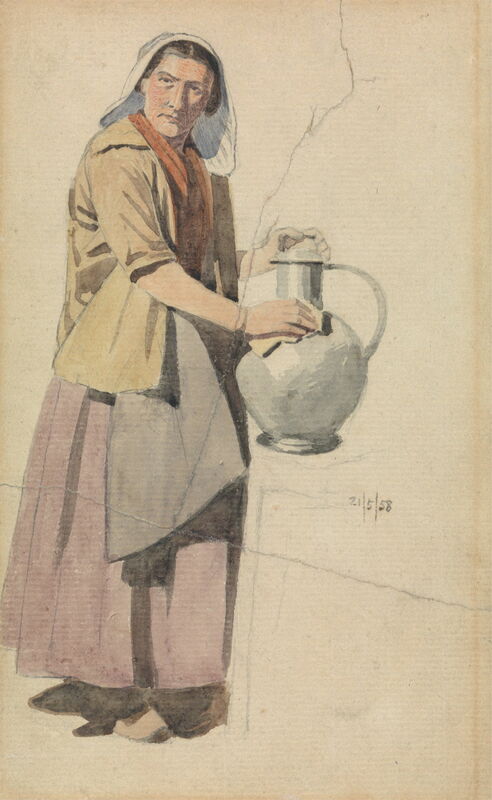 Crazy Jane, dated by him 6 September 1855, is a watercolour which is an exception to this, and perhaps gives a little more insight into those around him. With his lack of female models, his Jane is clearly a John, and he draws on peacock feathers and other objects from his faerie paintings. The recession of large crows flying from the distant ruined tower is particularly effective. Richard Dadd (1817–1886), A Fallen Warrior (1855), watercolour, dimensions not known, Victoria and Albert Museum, London. Image courtesy of and © Victoria and Albert Museum, London. 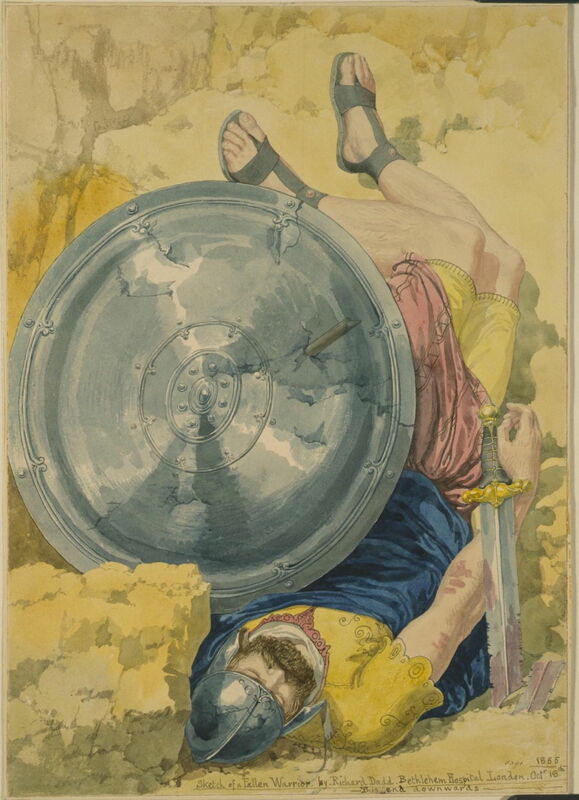 A Fallen Warrior, dated 18 October 1855, is a watercolour which harks back to some of his earlier Biblical narratives. It shows the body of a dead warrior folded up against rocks, a heavy broken battle sword at his right hand, and a damaged shield stood against his body. Dadd’s composition is original, filling his paper with the warrior’s body, but extremely disorientating: he gives us no clues as to whether we are looking down at him from above, or from the side. The artist even added to his inscription ‘This end downwards’. 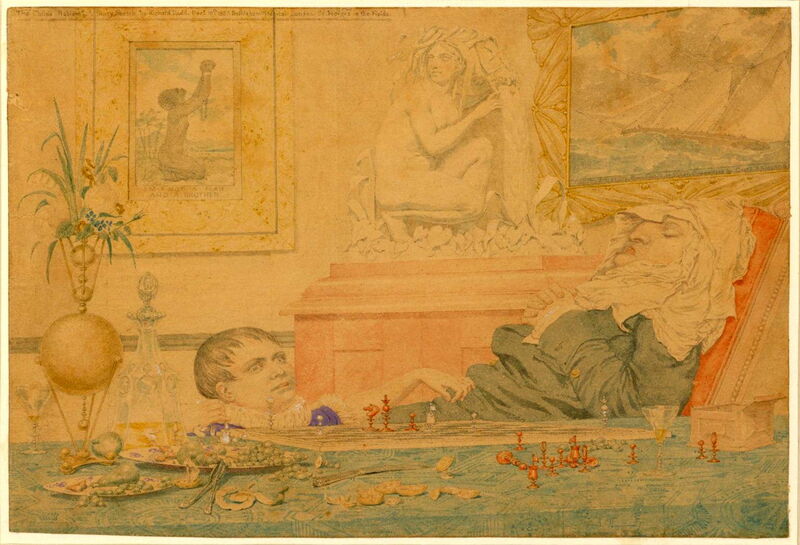 Richard Dadd (1817–1886), Sketch to illustrate the Passions: Want (1856), watercolour, dimensions not known, Victoria and Albert Museum, London. Image courtesy of and © Victoria and Albert Museum, London. He continued to add watercolours to his series of the Passions, here Want, the Malingerer dated 26 November 1856. From a hill overlooking the River Medway at Chatham, where Dadd was born and brought up, he shows a small family of destitutes. 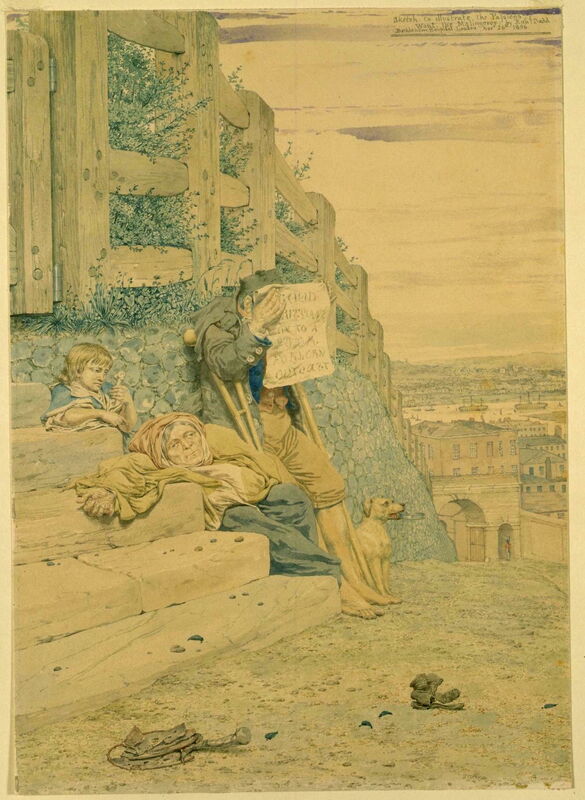 The father, his face hidden behind a poster seeking a “good Christian home to a poor forlorn outcast”, appears to be a military veteran, has a couple of crutches, and bare feet. The mother, her face aged far beyond her years, is slumped in her tattered clothing, her right hand stretched out, its wrinkled palm seeking charity. Behind them is their son, and beyond the father their dog holds a tin begging bowl in its mouth. Unusual among his watercolours is The Child’s Problem, dated 18 December 1857. The problem at the heart is the position on its chess board, considered by chess players to be simple enough as to have been set by a child. Around that are more puzzling references which are thought to relate to the anti-slavery movement, although I think that Dadd had more in his mind too. The painting on the wall at the left shows a slave holding up his manacled hands to heaven, with the words ‘AM I NOT A MAN AND A BROTHER’. That on the wall at the right appears to be a slave-trading ship, although its inscription is largely illegible. Between them is a sculpture of a classical goddess who I cannot identify. Dadd adds an even more puzzling still life on the table. There is a strange flower-holder, a decanter containing an amber liquid, the remains of a plate of fruit, including pears, chess pieces and the box for them. A child wearing a ruff appears about to play a piece on the chessboard, while an older woman or man with a very prominent nose is asleep under a white headdress. 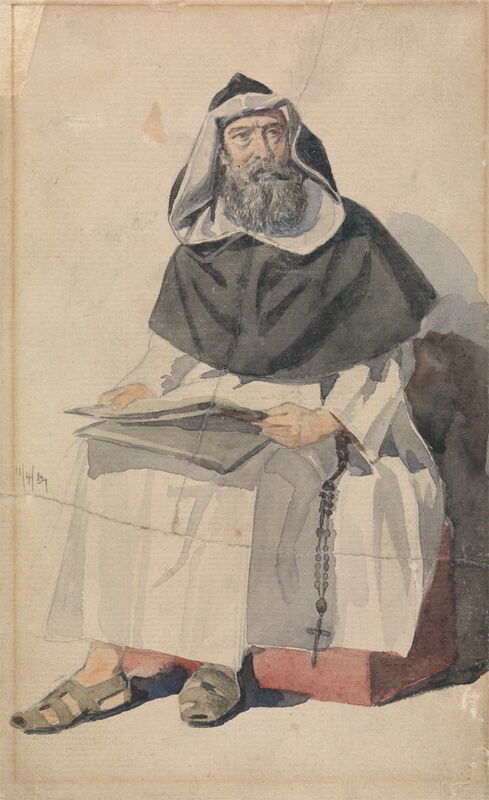 Richard Dadd (1817–1886), Portrait of a Monk (1857), watercolor over graphite on moderately thick, slightly textured, beige laid paper, 19.1 x 11.8 cm, Yale Center for British Art, Paul Mellon Collection, New Haven, CT. Courtesy of the Yale Center for British Art. Dadd had not exhausted his visual memory from his travels in the Middle East, and painted occasional works based on his sketchbooks of that period. Portrait of a Monk, above, is dated 11 April 1857, and Portrait of a Woman with a Pitcher, from 21 May 1858, is below. Both of these appear to have been torn into three pieces at some time, a constant risk to his work. Richard Dadd (1817–1886), Portrait of a Woman with a Pitcher (1858), watercolour over graphite on thick, moderately textured, beige laid paper, 18.8 × 10.5 cm, Yale Center for British Art, Paul Mellon Collection, New Haven, CT. Courtesy of the Yale Center for British Art. 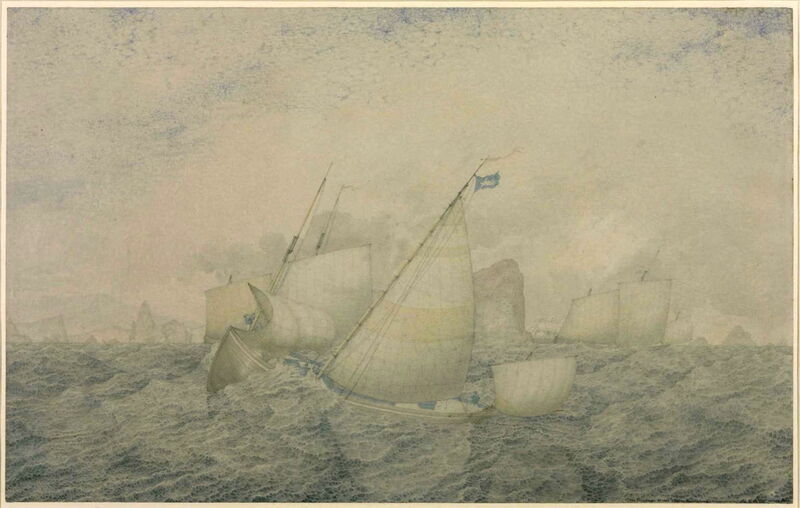 Dadd also had a sustained interest in drawing and painting sailing vessels, which must have been a considerable challenge to his visual memory. The Pilot Boat (1858-59) shows a cutter negotiating its way among rock pinnacles in choppy conditions. The sea has a remarkable texture which appears almost tactile, and Dadd remembered some subtle details which he shows in the rigging. Richard Dadd (1817–1886), Contradiction: Oberon and Titania (1854-8), oil on canvas, 61 x 75.5 cm, Private collection. Wikimedia Commons. By far his most wonderful and important painting of the 1850s is one of his few oils, Contradiction: Oberon and Titania (1854-8). This is Dadd’s first work which develops his previous faerie paintings into a new style, unique to him. Painted for Bethlem’s first resident Physician-Superintendent, William Charles Hood, who arrived in November 1852, Dadd was able to use an unusual and expensive oval tondo, and seems to have taken four years to complete it. Its theme takes Dadd back to Shakespeare’s Midsummer Night’s Dream, but its execution is like nothing that he had painted before. There is hardly a square millimetre of canvas which Dadd has not squeezed yet another curious detail into. Like other great imaginative painters (Bosch, for instance) before, Dadd’s dense details dart about in scale: there are tiny figures next to huge leaves and butterflies, and towards the top of the tondo these distortions of scale generate an exaggerated feeling of perspective. The contradiction of the title refers to the battle of wills between Oberon and Titania, and the conflict here centres on an Indian boy. Titania (inevitably somewhat masculine) stands just to the right of centre, the boy bearing her skirts. To the left of centre is the bearded figure of Oberon, an elfin lad holding him back by his right arm. At the right are Helena and Demetrius, despite Helena’s efforts, their love remaining unrequited. Beyond those central figures is an overwhelming mass of detail, miniature scenes and stories involving hundreds of extras, flowers (including the ‘Morning Glory’ convulvulus at the feet of Titania), leaves, an ornate swallowtail butterfly, a floating jade egg, fungi, and far more. Descriptors like hallucinatory and surreal spring to mind, and have been used in accounts of this remarkable painting. Quite what Dr Hood made of it, I don’t know. An explanation of the Fairy Feller’s Master-Stroke in literary terms. 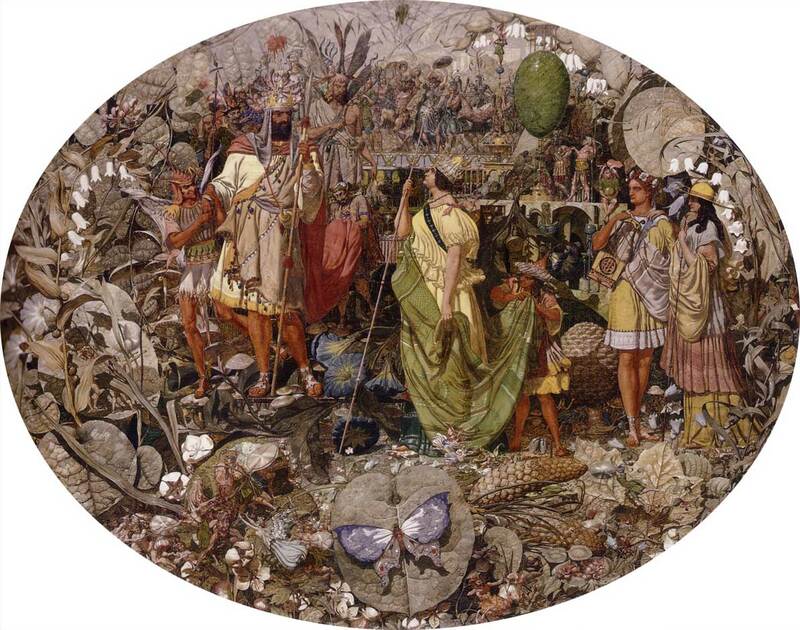 Tromans, Nicholas (2011) Richard Dadd, The Artist and The Asylum, Tate Publishing. ISBN 978 1 85437 959 7. Posted in General, Life, Painting and tagged Bethlem, Dadd, faerie, painting, PRB, Pre-Raphaelite, Shakespeare. Bookmark the permalink. Beautiful paintings! I have never heard of Richard Dadd, but am definitely intrigued now. Great post! Thank you: the best is yet to come too. Why doesn’t Mail size fonts correctly?